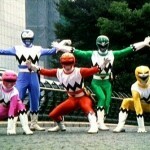 BigBadToyStore.com Sponsor Update- Massive Power Rangers Legacy Figure Restock Preorders Open! Site sponsor & all-around awesome place to shop online BigBadToyStore.com has opened PreOrders for heavy restocks of the Power Rangers Legacy toyline! Currently, the Power Rangers Legacy restocks are listed with a release date of February 2019! Stay tuned to TokuNation & BigBadToyStore as we keep you up to date on this fan-favorite action figure line! 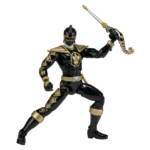 Legacy Psycho Black and Dino Thunder Yellow Coming – Massive Figure Restock? Fans of the Legacy Power Rangers toys are well aware of the massive restock coming this winter to online retailers of all the older Legacy roleplay items and Megazords. Today, GameStop has added even more upcoming items to their systems for older Legacy Power Rangers figures including the yet-to-be-released Legacy Psycho Black and Legacy Dino Thunder Yellow figures. You’re looking at a restock of all seven Mighty Morphin Power Rangers figures, all five Metallic Mighty Morphin Power Rangers figures, all five Dino Thunder figures, and all five In Space figures. 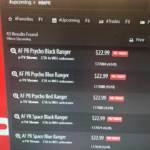 Nick Hurst posted in the Facebook Group “The Ranger Store” pictures of the GameStop computer systems showing all the upcoming listings. The new figures are listed below. They are not labeled as exclusives so the chance they end up at other retailers is there. The figures and their item numbers are below. The remainder of the new listings of older figures with their items is below. There is currently no ETA on when these will be released but our assumption is sometime this winter if not very early in 2019. It is important to note that just because these items are listed in the system does NOT mean that they will be releasing, only that the manufacturer has solicited the items to retailers in preparation to begin taking orders for fulfillment. With no listing for Psycho Pink or Psycho Yellow, the fears that those figures never made it past the early prototype stage before Bandai America pulled the plug are beginning to rise. Our fingers are crossed that they show up eventually, sometime, in someone’s system. But with the clock ticking until Hasbro’s official release date of product, the chances are growing slimmer. Special thanks to @liladam87 for helping compile all the information! We know that at least one case assortment that will be hitting stores will contain only the male figures. The female figures have yet to be seen in package, in production, or anywhere really. We’re still awaiting an update on the Zeo Yellow Ranger, who is part of the Series 4 figures and yet has not been released. The press photos do not appear accurate to what is going to be released. Many of the “shiny gold” parts of the figures end up being a dull orange color instead. This change first started with the Series 4 figures and continues int he Series 5 figures. Hopefully we will have some answers at Toy Fair next month as to why.